Most houses have a pitched roof and do not require a tilt frame to be installed. A flush mount system is cheaper to do because fewer materials are used and installation time is reduced because of this. Be sure to check the pitch of the roof and the orientation as well. In QLD a pitch of between 11 and 27 degrees is good This insures that the sun’s rays are hitting the panels at as close to a 90 degree angle as possible throughout the year. North facing roofs were a common option for installing solar panels on the generous 44c Feed in tariff because the panels were receiving sun throughout the day with optimum generation being received in the middle of the day. Now days it is more common and advisable to install on east and west facing roofs. Because the feed in tariff is so low the incentive to feed as much power back in to the grid has fallen away. 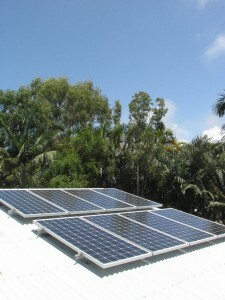 Instead we look at using as much of our power during the day as possible while our solar panels are generating. On the average house our power peaks are in the morning before work and after school or late afternoon. By installing solar panels on east and west we ensure that the peak generations are as close to our peak usage as possible. When the Solar mounting is installed the system should be installed so that the tin/colorbond roof is not compromised in any way. 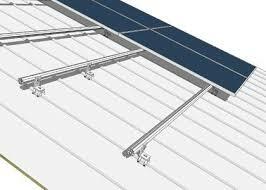 The L brackets that are fixed to the roof should have a rubber isolation pad that separates the aluminium from the roof. This helps prevent metal on metal corrosion as well as providing a watertight seal. The mounting system should be installed with certain L foot spacing intervals. These L feet are screwed directly to your roof battens or purlins and the installer needs to ensure that he is using the right spacing for the batten material and the right screws for the application. Tile roofs are different in installation because the brackets used are different. The tiles have to be lifted to expose the roof battens where the tile brackets are fixed to using the appropriate wood screws. Ensure that your installer grinds the tile out where the bracket will sit otherwise the tile will not sit flush and possibly allow water ingress. In all cases as mentioned in Solar Mounting systems PART 1, it is important to choose a solar mounting system that is approved for installation in Australia and your area. Ask your installer about their solar mounting system. Be sure that it is made from quality products and is approved for use in your area.